Custom indicates that when a young man wanted to wed a young lady, he would carve a spoon from wood and present that to his betrothed. This practice is apparently very ancient (1600's) and was practiced in the present day areas of Finland, Norway, Sweden, Russia and Wales (and perhaps elsewhere). A few notable museums (Paris; Gothenburg, Sweden) exist which contain exhibits of these old spoons. Carved wooden spoons are now primarily made for the tourist industry and are readily available to the collector. There are shops which specialize in carving spoons for tourists and the spoons are really very pretty. I believe, however, that it takes special equipment to tell which of the wooden spoons are reproductions vs actual old pieces. To my knowledge old silver spoons made in this tradition are quite rare, but I have been able to obtain one of these. The vast majority of these spoons are made for tourists (see below). 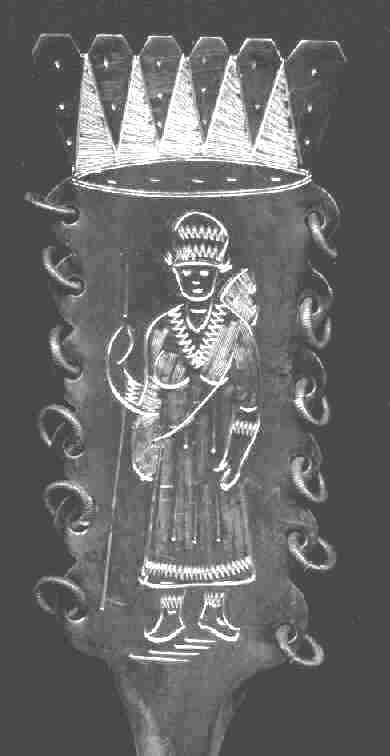 The top of the handles are typically engraved with a male figure. The rings are said to afford protection against evil spirits, but may also represent the number of reindeer in a brides dowry. 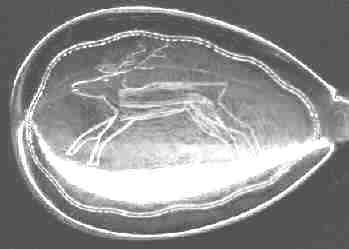 The bowls are typically engraved with a reindeer or related scene. The bowls are usually shaped in the "old style" with the wide part at the front. This spoon is also a tourist version, but is a little older. It has a different style of engraving. 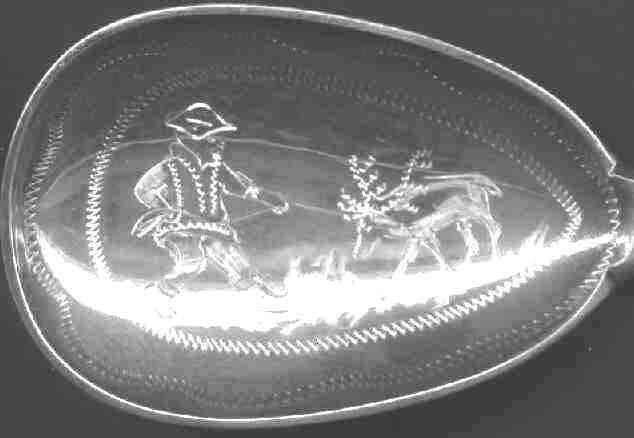 A Lap reindeer spoon made out of horn or bone. A number of different versions of these spoons are available in a variety of materials. 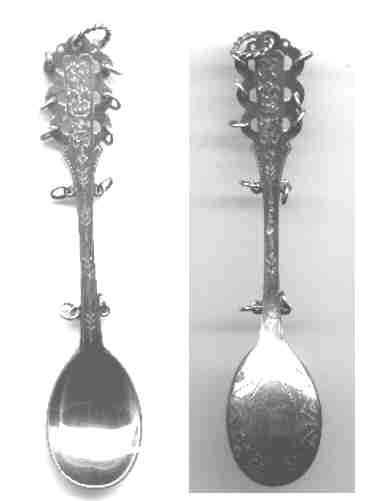 Shown is the front and back of an actual Lapland 813 silver spoon (4 5/8" 120mm) made in 1885 by silvermaster Hagglund. It carries a complete set of Finnish silver marks which enables me to date it accurately. The spoon has extensive engraving on both sides and also has a number of rings. The front of the bowl is gold washed. The engravings are not clear in the pictures, but are quite pretty in person.